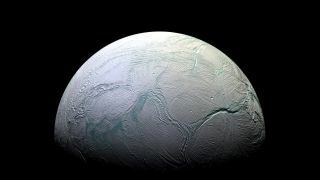 Saturn's ocean-harboring moon Enceladus, as seen by NASA's Cassini spacecraft. M. okinawensis grew well and produced methane in the team's experiments, which perhaps isn't terribly surprising, given that the organism was isolated from a hydrothermal vent off the Japanese island of Okinawa, at a depth of about 3,200 feet (975 meters). Cassini image of Enceladus' geysers blasting material from the moon's subsurface ocean into space. The new study was published online today (Feb. 27) in the journal Nature Communications.